My LO is apparently a major major Donald Crews fan right now and Bicycle Race may be the winner. LO loves numerals, loves rainbows, loves ordering, and loves ordering numerals and rainbows. This is a book crazy with number, color, and playful scrambling of order. This is a number picture book. The numbers are in different reading order because of the place or position the racers were in. It was nice to see that number nine won the race after having problems with her bike. This book can be used in a prek-1 grade to learn to identify numbers. Students can use toy cars or bikes to role play with the numbers like in the book. Interesting format, great use of the numbers and counting to tell a narrative, even if it was quite predictable once you saw what was going on. I like to see creative ideas like this. However, the charm of the style and format is also what made it completely inappropriate as a read-aloud story, which is what I was looking for when I ran across it. An interesting counting book, we were routing for #9 from the beginning. 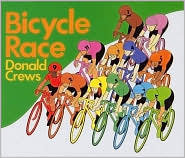 While we generally enjoy Donald Crews' books, this one was not one of our favorites.